1 - nightshirt/s $34.90 ea. 2 - nightshirt/s $32.90 ea. Better way to sleep! 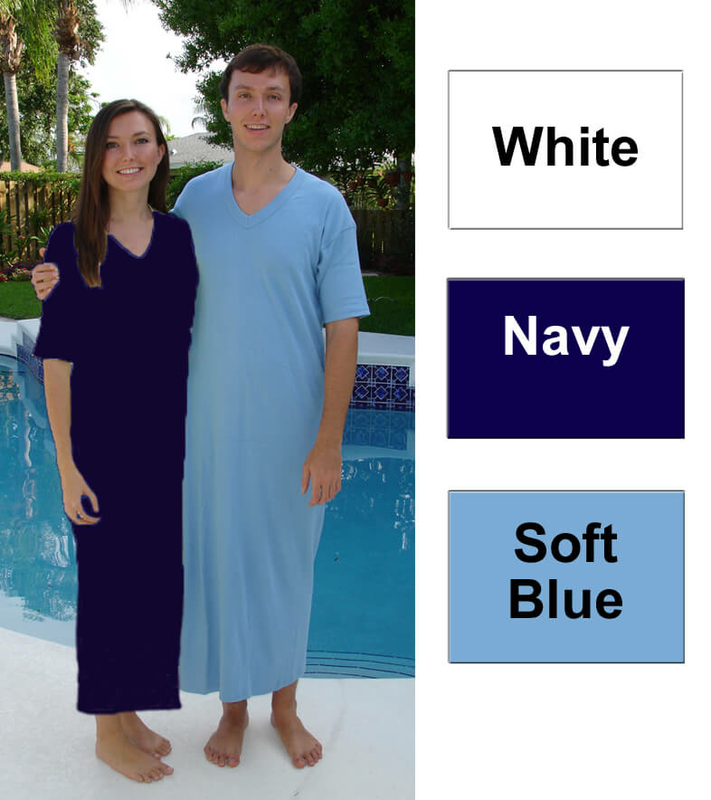 Wittmann Textiles Company V-Neck Tee-PJ™ Nightshirts in the Long (55") Length in Short Sleeves are made with the same soft, Premium Combed Ring-spun 100% Cotton knit comfort of our Original Tee-PJ™ Nightshirts. David is wearing the Long Length and Julia the Regular length. Please use the size chart below for best fit. We find your size is usually at least one size larger than you would wear in a t-shirt - circular knit sizing instead of t-shirt sizing. Quality made in the USA. Larger sizes are more: 3XL is $2 more, 4XL/5XL is $4 more, and 6XL is $5 more per nightshirt. Machine wash/dry; no bleach, no hot water - durable and will last several years. Color or bleach effects the thickness of the fabric- White will be the lightest due to the bleaching process, soft blue will be slightly heavier with the dye, and then the darker colors will be slightly heavier still. Note: Size S available in blue; Size 4X/5XL available in blue or navy; and 6XL in navy only. IMPORTANT Long Sleeve Note: LONG SLEEVE STYLE is $5 more per nightshirt - please look under Nightshirts/Vneck Tee-PJ™ Nightshirt - Long Sleeve 100% Cotton USA and in Navy color only - thanks. This style is not advertised - Prices are as stated. Shrinkage Note: The Long Length will shrink to about 48-51 inches after many washings depending on the size (size 4X/5X will shrink to about 48 inches). The WIDTH stretches 3-4 inches in width over the life of the nightshirt - please use one size larger than you would normally wear in a comfortable t-shirt.